Abstract: All measurements are performed with a goal, ranging from the assessment of the compliance of a product with a specification to the characterization of a new material. 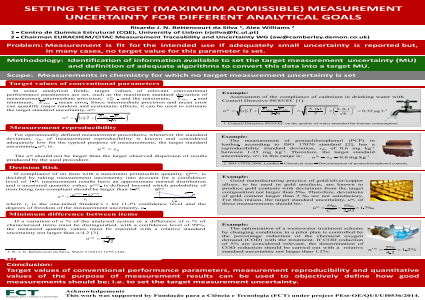 The adequate fulfilment of this goal depends on the fitness of measurement uncertainty (MU) for its intended use. The assessment of the compliance of a gold alloy with a specification for gold content must be performed with a low uncertainty due to the price of this component. The characterisation of a meteorite must be performed with an uncertainty small enough to distinguish their composition from other minerals. Therefore in setting the measurement requirements, in addition to specifying performance parameters such as recovery, repeatability and bias, it is also necessary to set a target value for the MU. The International Vocabulary of Metrology [http://www.bipm.org/vim], defines the “target uncertainty” as the “MU specified as an upper limit and decided on the basis of the intended use of measurement results”. Unfortunately only in a few cases does the specification and/or the legislation define the target measurement uncertainty required for compliance assessment. This communication will describe how to set the target MU to achieve the goals of the measurement.